Both women's and men's races will be sent with the older competitors first, and the rest will follow in varying intervals. The intervals will get shorter as they go. The course will run two half mile loops - starting along the Kapahulu Groin and heading out for a right turn on the first buoy. The swimmers will then keep the remaining 3 buoys to their left as they round the course and head back in. If there is any surf, the swimmers might try some bodysurfing on the inside. The swimmers will exit the water for a brief beach run before starting the second loop. After the second loop, swimmers will head straight up the beach through the finish chute. The top 10 across the finish line will receive awards. The elite race will be sent with the women first and the men to follow. 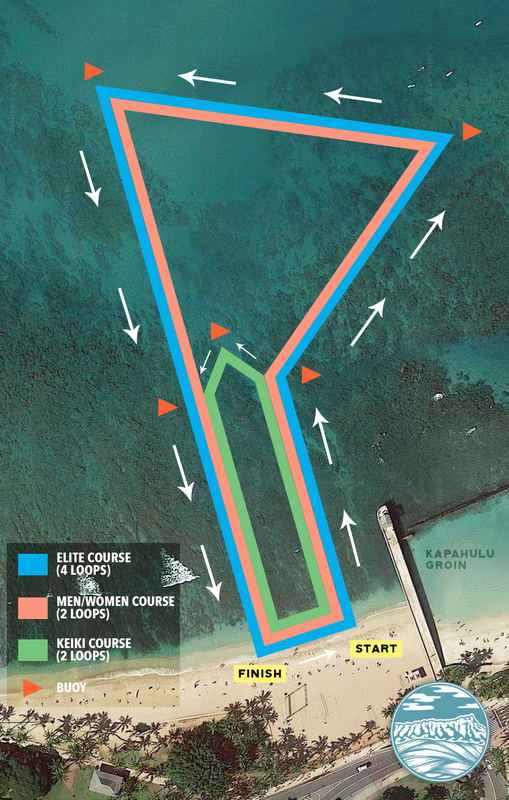 The course will run four half mile loops - starting along the Kapahulu Groin and heading out for a right turn on the first buoy. The swimmers will then keep the remaining 3 buoys to their left as they round the course and head back in. If there is any surf, the swimmers might try some bodysurfing on the inside. The swimmers will exit the water for a brief beach run before starting the next loop. After the fourth and final loop, swimmers will head straight up the beach through the finish chute. The top 5 across the finish line will receive awards. The keiki race will be sent with the youngest competitors first, and the rest will follow in varying intervals. The intervals will get shorter as they go. The course will run two quarter mile loops - starting along the Kapahulu Groin and heading out for a left turn on the first buoy. The swimmers will then keep the remaining 2 buoys to their left as they round the course and head back in. If there is any surf, the swimmers might try some bodysurfing on the inside. The swimmers will exit the water for a brief beach run before starting the second loop. After the second loop, swimmers will head straight up the beach through the finish chute. The top 10 across the finish line will receive awards.